Picture by Michael Rogers - from Twitter. What do riders do when they have time off? I guess that is difficult to answer, considering there are possibly as many differences as riders. As I wrote in The unsung heroes II, riders tend to relax as much as possible when they have time off. That is pretty much what every athlete is doing, at least endurance athletes. From time to time young football players open their homes to TV-features and give us a glimpse of how they live their lives. Mind you, beside the fancy clothing and the mandatory bling-watch, they also relax. I will not criticize or jugde them, all though some have argued that footballers are getting way too much money for very little actual training. But if you think they are just taking naps and eating, you're wrong. They hit the couch and play PS 3 online with other players. All day. Michael Rogers sent out a picture of Geraint Thomas and him playing chess in December. Kurt Asle Arvesen updated his Twitter profile yesterday with a picture of EBH and Lars Petter Nordhaug playing chess, picture here. As if that wasn't enough, probably just for the heck of it, Arvesen sent the picture to Magnus Carlsen, the 21-year old chess Grandmaster from Norway, to get a comment on who-should-do-what. As you might expect judging from the picture, the Grandmaster didn't give EBH much credit. In other words; there are no reasons why Edvald should leave his day-time job for the time being. Who is the lead figure in playing chess on Team Sky is uncertain for the time being, even who's responsible for this trend's somewhat unclear. Riders playing chess is not something unique to Team Sky. 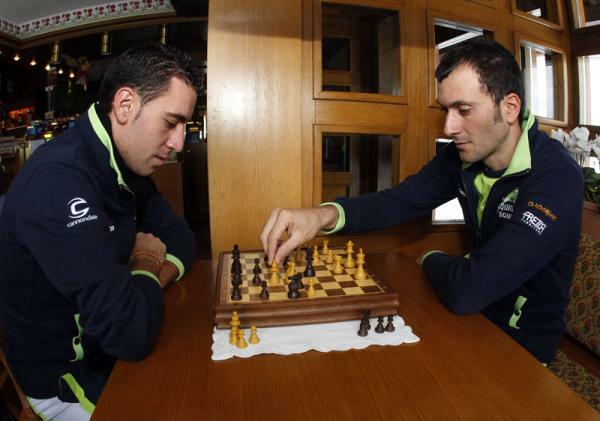 Take a look at Nibali and Basso playing a game of chess at the training camp in the Dolomites in December. "Cycling's similar to chess on wheels. In a road race you can be the strongest guy in the race and finish nowhere. Or you might not be the strongest, but make the right decisions and win. It's never clear-cut. There are tactics and there is the mental game plan, and that, hopefully, is where we can help make a difference." I will not claim this is the reason some cyclists play chess. Perhaps does it feel good to use the head after some long monotone hours on the bike? Whether Team Sky will benefit tactical from playing some games of chess is unclear but at least the riders relax and time fly by. Many will probably be happy they're not wearing the latest bling on the market while playing. Picture: Downloaded from cyclingnews.com, more specifically here.